Freighter's Mike Dawson handing over some very hard-working trailers to John Kendrick. BOOMING: Freighter's Mike Dawson hands over hard-working trailers to John Kendrick. STARTING a transport business is a process that has defeated many more budding transport moguls than it has made. The competition is vicious, the cash costs are astronomical, the invoices can linger unpaid for many weeks and there are still too many cowboys with licences to hire who shouldn't be on the road. But today's mining economies in Queensland and WA must be a good time surely, with huge demand for services, new mines and developments soaking up people and equipment, and the state governments encouraging it all. In fact, the booming conditions just widen the range of things that can test you. John Kendrick, previous general manager of another large WA carrier and himself a 40-year veteran of the industry, branched out on his own just four months ago. 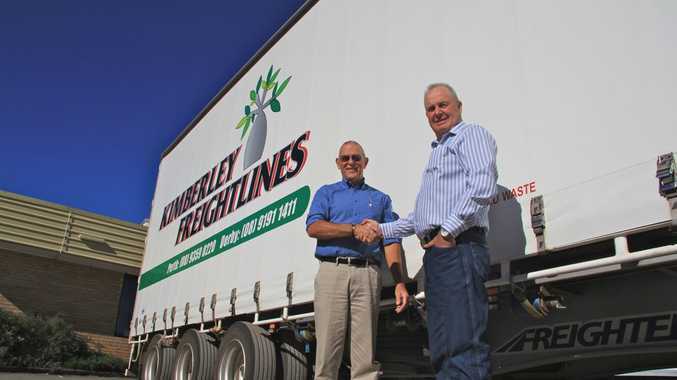 Kimberley Freightlines services the Perth to Kimberley route for several large mining and construction groups. John told me his trailer of choice is Freighter and accordingly his latest additions to the fleet are Freighter drop-deck T-liners. John's focus is on handing his customers a level of service they can rely on in any conditions. With business booming John didn't have enough trailers to service the demands of the route. Try finding a new trailer in stock anywhere in WA right now. Make it a specialist version and you can forget it. When lining up two new trailers, John had to aim for the highest level of load security. Freighter's LoadHold load restraint curtains include fibreglass pultrusions from the curtain track down to the buckles and straps. They are rated to meet NTC Load Restraint Guidelines for a unitised load of 1400kg per pallet or up to two tonne for a load specific configuration approved by Freighter. But John's customers were a bit more demanding, plus the route is one of the biggest challenges in trucking. The Perth-Derby run, at 2500km, is twice as far as the iron-ore regions dotted around the Pilbara and tests even the best of transport gear. Bad cambers, broken surfaces, wandering cattle and road temperatures often more than 60 degrees are just some of the challenges thrown up at transport operators. "This is one of the harshest routes in the country," said John. "My mining customers insist on gates - in fact they won't allow a non-gated trailer to unload on site - and due to the sensitive nature of some of the cargo, I can't afford any risk of damage at all." Mike Dawson is one of the reps for the multi-brand MaxiTRANS group in WA and brings more than 35 years of varied transport industry history to its Western Australian operations. The experience came in handy when John Kendrick needed a fast production process and some customising work added to a new trailer order. Combining conventional gates with the Freighter LoadHold curtains satisfies his customers and benefits John as well. The trailers are also fitted with mezzanine decks and with these extra levels of safety, John goes out on a limb and guarantees his customers their freight will arrive on time and in perfect condition. Big call. Due to the extreme conditions, each trailer is run over the pits and serviced at each turn around. A breakdown en route would not only make his commitments look a bit dodgy, but would cost several thousand dollars in recovery charges.